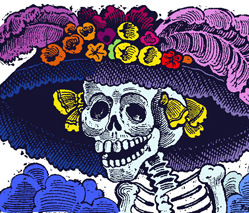 Although today (Nov, 2nd) we officially celebrate in Mexico The Day of the Dead, one of our most colorful and beloved traditions, since last Friday, October 30th the eco park Xcaret is presenting the Festival de Tradiciones Vida y Muerte 2009. A celebration full of culture, tradition, music, food and live performances. 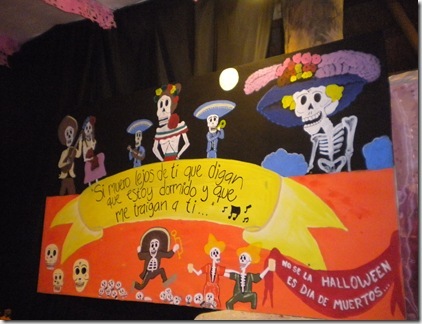 Visiting Xcaret Eco Park for the first day of the Festival de Tradiciones Vida y Muerte 2009 was a great experience. Although we arrived a bit late (it started at 4p.m. and we got there around 7 p.m.), the place was full of people willing to spend a great evening. Regional cuisine was all over the place with a esplanade full of Mayan families sharing their dishes: vaporcitos (tamales) and cochinita pibil were our favorites. At one side of the esplanade, we discovered a lot of workshops too: dancing, painting & writing to name few. But besides all the food and the workshops, visiting the graveyard was the most colorful and exciting thing to do. All the graves were illuminated with candles, flowers, food and other offerings. Completely worth seeing. In this first day of the Festival, we had the chance to enjoy some theater plays, regional music performances and even a traditional Mayan Ball Game! In our opinion, the exposition of the altars was very well set too. Along the different altars (around 15 different from various places of Mexico) you could read their history, and their meaning and there were even some nice persons sharing their knowledge about such an incredible tradition to the visitors. The fourth edition of the Festival de Vida y Muerte of Xcaret fulfilled our expectations. We can’t wait for the next year!